What is the meaning of this cross and its diverse components? Represents human suffering caused by the sins of humanity. Suffering abounds in the world and is meaningless if not offered up to God. It is the Heart of Jesus, a living and beating heart. We find this Heart hidden in the midst of human suffering. It gives meaning and value to this suffering. Our sorrows and sufferings are caused by our sins, but Jesus takes them and transforms them into an instrument of salvation. 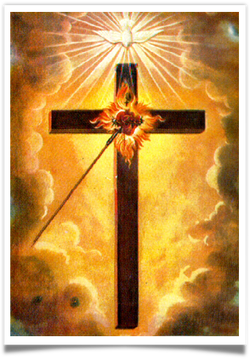 It is the cross of the Sacred Heart of Jesus, a cross he carried all his life. It represents the innermost sorrows of his soul, caused by the sins of those who are closest to him. Sheds light on all this mystery and helps us understand and live it with love. God the Father, symbolized by the light, surrounds the entire mystery, giving the cross a seal of glory and the promise of resurrection, as He lovingly accepts the sacrifice of Jesus and his Church. Que significa esta cruz y sus diversos elementos? Representa el dolor del ser humano como consecuencia de su desperdicio, cuando no se lo ofrecemos a Dios. Es el Corazón de Cristo, pero un corazón vivo, palpitante, que se encuentra en medio del dolor humano y viene a darle sentido y valor. Cristo Jesús toma nuestro dolor para transformarlo y de ser una consecuencia del pecado, lo convierte en instrumento de salvacion. Es la Cruz del Corazón de Jesús, la cruz de toda su vida, la que llevó clavada en su alma por el pecado de la humanidad. comprender y vivir con amor. Es la presencia de Dios Padre, simbolizada en la Luz que envuelve todo este Misterio. Esta Luz le da a la Cruz su dimension de Gloria y Resurrección.